Philip David Charles Collins (born 30 January 1951) is an English singer, songwriter, drummer, record producer, and actor. He was the drummer and lead singer of the rock band Genesis and is also a solo artist. Between 1983 and 1990, Collins scored three UK and seven US number-one singles in his solo career. When his work with Genesis, his work with other artists, as well as his solo career is totalled, Collins has more US Top 40 singles than any other artist during the 1980s. His most successful singles from the period include "In the Air Tonight", "Against All Odds (Take a Look at Me Now)", "One More Night", "Sussudio" and "Another Day in Paradise". Born and raised in west London, Collins played drums from the age of five and completed drama school training, which secured him various roles as a child actor. He then pursued a music career, joining Genesis in 1970 as their drummer and becoming lead singer in 1975 following the departure of Peter Gabriel. Collins began a solo career in the 1980s, initially inspired by his marital breakdown and love of soul music, releasing a series of successful albums, including Face Value (1981), No Jacket Required (1985), and ...But Seriously (1989). Collins became "one of the most successful pop and adult contemporary singers of the ’80s and beyond". He also became known for a distinctive gated reverb drum sound on many of his recordings. 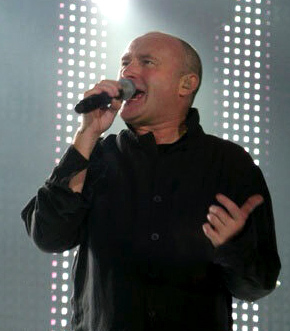 In 1996, Collins left Genesis to focus on solo work, but returned for their Turn It On Again Tour in 2007. Following a five-year retirement to focus on his family life, Collins released an autobiography and began his Not Dead Yet Tour which runs from June to December 2017. Collins’s discography includes eight studio albums that have sold 33.5 million certified units in the US and an estimated 150 million worldwide, making him one of the world’s best-selling artists. He is one of only two recording artists, along with Paul McCartney, who have sold over 100 million records worldwide both as solo artists and separately as principal members of a band. He has won seven Grammy Awards, six Brit Awards, two Golden Globe Awards, one Academy Award, and a Disney Legend Award. In 1999, he received a star on the Hollywood Walk of Fame and was inducted into the Songwriters Hall of Fame in 2003, the Rock and Roll Hall of Fame as a member of Genesis in 2010, the Modern Drummer Hall of Fame in 2012, and the Classic Drummer Hall of Fame in 2013. Despite his commercial success and his status as a respected and influential drummer, music critics are divided in their opinion of his work and he has publicly received both criticism and praise from other prominent music artists.